Few things irritate me more than having a deadline or appointment jump out at me from nowhere. It makes me feel like my whole world is upside-down and I need to take back control of my life. 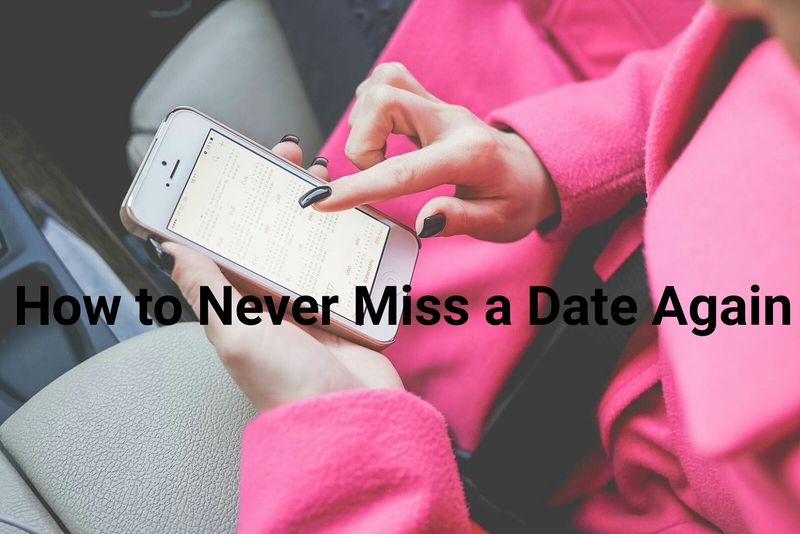 Here are a few tips to help you never miss an important event or date. 1) Buy a planner- I love Typo planners but they’re a bit too expensive for me. Instead I use an ordinary dated diary as well as my cellphone to keep track of dates. 2) Write down everything- First start with concrete events that you know won’t change such as birthdays or your weekly night out. Then enter in important dates such as deadlines for a project. 3) Plan a week in advance- I like to think of myself as pretty organised. Those dates that I miss are usually family events that for some reason my mother doesn’t tell me about (am I not family? Maybe not). To compensate for her serious error, I ask her well in advance if she/me/we has any plans for the week ahead. If she gives me an event we need to attend, I list it down. If not I simply plan my week around that. 4) Use your planner on a regular basis- You could have the most gorgeous (Typo) planner but it doesn’t matter if you’re not using it. Be sure to check your planner often to keep on track with dates and to add in new ones. How do you keep track of everything? Have you ever forgotten an important date? (I forgot my parents’ anniversary once). Let me know below. 2) Pretend you earn less than you actually do: I consider my earnings as a little less than the amount I have left AFTER I have saved. For example, if I have R500 after saving then I pretend I earn R300. That R500 is to remain untouched until absolutely necessary (I will discuss this later). This method work out as a great way for me to save money since at the end of every month I am surprised by my bank balance. Why do I still have money? Oh, yes- I earn more than I think I do. It feels like a present from me to me. Thank you, me. 3) Make a budget…but round everything up: I like to round up my expenses to the nearest hundred. This ensures that I am able to cover them sufficiently as well as having some extra money in case I need it. For example, the petrol price went up by a HUGE amount one month. It was a major strain on finances but it affected me just a small bit because of all the money I have saved. 4) Similarly, round up your spending budget as well: Make a list of what your usual purchases are and round that up too. I always over-budget for food (which I rarely buy) and clothes (just in case it turns out that I’m outgrowing them…AGAIN) so I know that I am always covered. 5) Remember to keep something for a rainy day: This is very important. Put aside money to use in case of an emergency. When I first started work, I was crazy about this. I insisted on keeping R500 in my account no matter what. I wouldn’t use the money even if I had no money for petrol or food. That money was not to be touched. This came in handy when all of a sudden, my car battery died and needed to be replaced. I was thrilled that my responsible ways finally paid off. How do you budget? Are there any tips you have that I might have missed? I’d love to know below.